Commonly known as artillery or “arty” for short, the SPG is a truly unique vehicle class in World of Tanks, and a significant number of World of Tanks fans play them. Coming a long way in their development, SPGs have found their place among existing vehicles starting off as pronounced "damage dealers" that evolved into support machines. Now’s the time to tell you how we want to change their stun parameters based on a long study of statistics and your feedback we’ve accumulated since 2017. In April 2017, we adjusted the artillery settings as part of Update 0.9.18. Since then, World of Tanks has changed significantly but SPGs as a class have remained largely untouched. We've added new branches of vehicles and new nations, and reworked elements of the matchmaker. Now we’re finally ready to take the next step and make some adjustments to this unique class. But first, let's look at how artillery has evolved in recent years. Those of you who played World of Tanks before Update 0.9.18 will remember the significant damage that artillery could cause, thanks to their high alpha. Shells struck you suddenly, and you didn’t have the opportunity to avoid them. This situation concerned the overwhelming majority of vehicles, no matter the armor thickness. The possibility of playing in Platoons consisting of two or three SPGs. Thanks to their coordinated work, such a Platoon could control the entire map, having too much influence over the outcome of local battles in different directions. But also for those who played on SPGs, it was no picnic. The long reloading time (much longer than other tanks), low accuracy and high dispersion served as a kind of retribution for their excessively high combat effectiveness. Increased SPG accuracy and reduced their dispersion and aiming time. In addition, in order to turn SPGs into effective team players, rather than individual machines, we introduced an entirely new stun mechanic. Now, tanks caught in the arty burst radius had their characteristics temporarily weakened. As a result, an arty’s successful actions on the allied team could bring invaluable benefits and turn the tide of battle. Changes we made have had different effects on all SPGs, but in general the number of penetrations decreased significantly. During the rebalancing process we significantly reduced the nominal damage of HE shells and decreased the average damage caused by arty, both during the battle and with a single shot. NOTE: As a result of all the changes, the full-damage penetration rate of all SPGs significantly decreased. For example, the Object 261’s full-damage penetration rate decreased sevenfold. In addition, Tier X SPGs began to cause 6% less damage per battle on average. Our adjustments will consist of several large blocks. First we're planning to reduce the duration of the stun from all artillery hits on already stunned vehicles. But let’s quickly take a look at a bit of theory, it will help you better understand the mechanics of the upcoming changes. How is the Stun Time Calculated Now? The first component is constant for each SPG shell and doesn't depend on the damage inflicted. In the shell settings, this value is set by a coefficient from 0 to 1, and in your Garage it's displayed as "minimum stun time" in seconds. This is one of the balance parameters of the shell - the same, for example, as penetration or velocity. This parameter is configured individually for each SPG shell, which has the ability to cause stun. The second component is a conditionally variable value, which is calculated depending on the damage caused by the shell. This characteristic is not specified in the game client directly, but it's easy to calculate. This value depends on the damage, and each time it is different. For clarity, let's consider the situation when the Object 261 fires at the IS-7. We will modify the constant component of the stun, which doesn't depend on the damage. Accordingly, we'll increase the influence of the variable component by 5%. Using the example of the Object 261, this ratio will change from 0.45 and 0.55 to 0.4 and 0.6. This will change the minimum stun time for the Object 261 from 13.05 to 11.67 seconds. We will also modify the second component of the stun, which depends on the damage. We will change the distribution of damage from the splash depending on the distance from the tank to the center of the explosion. Now this range is from 0.5 in the center of the splash to 0.15 on the edge. We will reduce the amount of damage at the edge of the splash from 0.15 to 0.05. This will decrease all splash damage, except for cases when a high-explosive shell explodes directly on the armor. And this, in turn, will lead to a slight decrease in the second component of the stun. 3. If you are already under the effect of being stunned, then any further stun is halved (1/2 stun). To better understand this mechanic, let's take a look at a specific example below. 4. 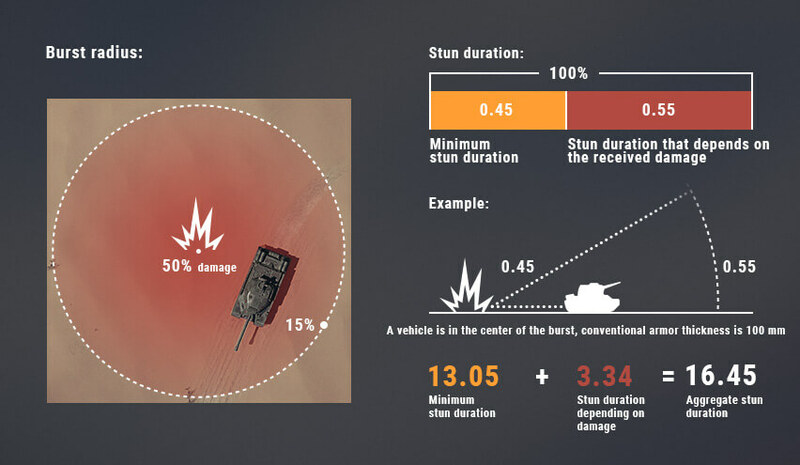 We will reduce the stun time when an SPG shell hits a vehicle, which is already under the effect of a stun, if this machine is equipped with a Spall Liner. Now the Superheavy Spall Liner will reduce the additional stun time by an additional 20%, and a Heavy Spall Liner by 10%. For example, if the additional stun time is 15 seconds, when using Superheavy Spall Liner it will be reduced to 12 seconds, and in the case of Heavy Spall Liner to 13.5 seconds. Currently, if the additional stun time is longer than the remaining time of the previous stun, then the additional stun time is added to the total stun time. The first stun is 20 seconds. After 12 seconds, another shell hits your vehicle, adding another 23 seconds. The first stun is 20 seconds. After 12 seconds, if another shell hits your vehicle, it adds another 23 seconds. It is then halved, so the total stun time is 8 + 12 = 20 seconds. As you can see, the difference between 31 and 20 seconds is significant. During this time, you can change your position, deal damage to opponents, reset the base capture, etc. Thanks to the new mechanic, the stun time from the repeated hit of an SPG will be greatly reduced. There will also be more cases in which the stun timer will not change at all when you are additionally stunned. If the time of any stun is less than 5 seconds, the stun time will not apply. Reduce shell velocity by 35 m/s (395 -> 360). Increase the dispersion from turret rotation by 0.02 (0.46 -> 0.48; 0.44 -> 0.46). Everything above is just our operational concept of the SPG rebalance. First, we want to test all these changes extensively during supertests. And of course, we want to know your opinion regarding our suggestions. We will continue to work on further rebalancing of SPGs based on the test results and your feedback.